What is the best way to bring a knowledge framework to the world — in the open — to allow as much as possible teams, and individuals of any kind to use it, reflect on it, give feedback and contribute back? That’s a tough question, we’re learning our way through. As the loyal reader will know, we started developing the Platform Design Toolkit methodology (some will argue this is actually a methodology, preferring to call it a “method”) in 2013, it started as one canvas, it was used, helped many, grew into a complex (too complex?) set of tools, a user guide and more (library of patterns for example). You can check the latest 2.1 release here. 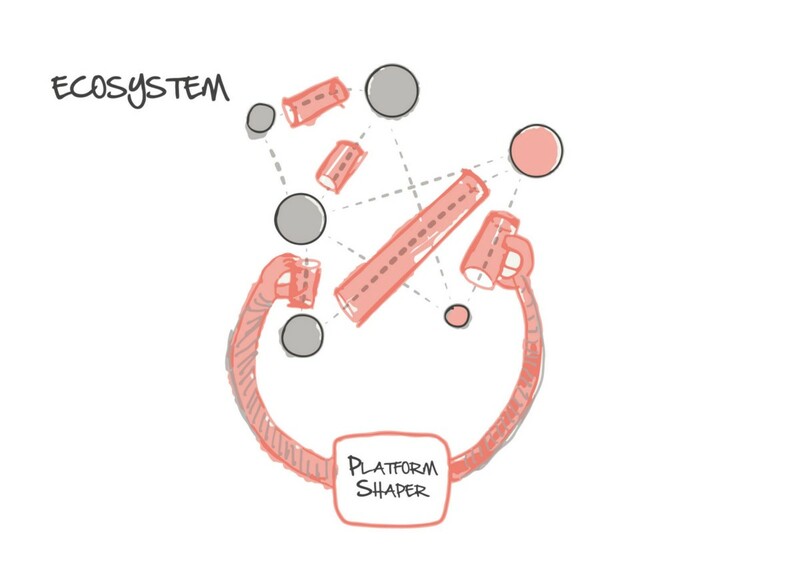 As we had the chance to explain already, we’re on a quest to “demystify platform design”, somehow trying to — more generally — make Systems Thinking, something easier to play with. We’re absolutely conscious that this is a complex matter, and we’re also conscious that the risk is big to end up providing a complicated solution to this complex problem. On the other hand, we’ve got countless feedback that a guided process has helped many to start their journey into envisioning strategies that mobilize, create new products and services, imagine new ways to develop organizations, without experts’ help! Who’s the expert anyway, on this matter? On our way in this journey, we realized that not everyone is ready, or just doesn’t need, to go through a step by step process from mapping ecosystems, to prototyping strategies. The diversity of contexts where this thinking can be applied is huge, and continues to amaze us. A few months ago, this reflection brought you our first set of 12 Patterns of Platformization: this library is showing to be such a powerful tool in our conversation with adopters, and it’s always good, when facing real situations, to bring the patterns on the table and reflect on the ways a particular market can be approached, and shaped for good. A natural step of this process, is to continue unbundle this model of thinking, renouncing to the temptation of “bundling” it in more complex procedures, one-size-fits-all solutions. The question here is to avoid to create a ever more specialised “hammer”, because “if all you have is a hammer, everything looks like a nail” (thanks bro Stelio Verzera for reminding me this all the time). 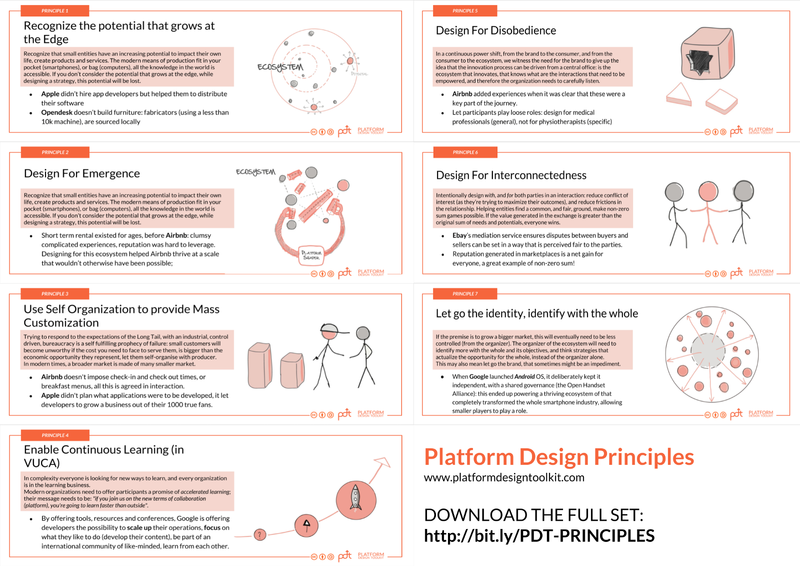 In an interestingly enough process, by developing this method(ology) in the last few years, we’ve been able to get back to the essence of principles, and here’s what we share with you today, a (first iteration of a) list of 7 Platform Design Principles, that you may want to keep handy when designing strategies for the modern, complex, interconnected and digitally transformed world of the XXIst century. Consider this a first version of your Organizational Revolutions: a short course on Market Realness, to quote, and freely iterate, on the amazing work of Oli Anderson that I’m digging into these days. Principles are — by far — the easiest thing to use in your daily practice of mobilizing ecosystems through platform strategies: you can apply them to everything you do already, or planning to do, such as a new product or service, a new organization you’re building, a processes you’re evolving. Among all the principles of platform design, this is the most important. Recognizing that small entities (individuals, teams, small organizations) have today an increasing potential to impact their own life, create powerful products and services, transform systems, is key to understand the platform model. Why? The modern means of production fit in your pocket (smartphones), or bag (computers), all the knowledge in the world is accessible in the open (open source software, wikipedia, youtube), from the periphery you can summon an increasing number of centralized utilities (e.g. : computing-as-a-service, machine learning, data). If one doesn’t consider the potential that grows at the edge, while designing a strategy, this potential will inevitably be lost. A single employee can transform the future of a company. Apple didn’t hire app developers but helped them to distribute their software. Opendesk doesn’t build furniture: fabricators (using a less than 10k machine), are mobilized locally. Is it possible to manufacture an ecosystem? No. This principle is one of the hardest to understand for the industrial organization in transformation. Companies have been (slowly) coming to terms with the idea that no one should design a solution for a problem that doesn’t exist, but still have hard times understanding that designing a strategy to mobilize — a platform — doesn’t work if no ecosystem is there to be mobilized. Platform strategies need to be designed to help existing ecosystem emerge, thrive and work better: platform design is the equivalent of plugging wires between electric potential, where a potential exists, the current will flow. 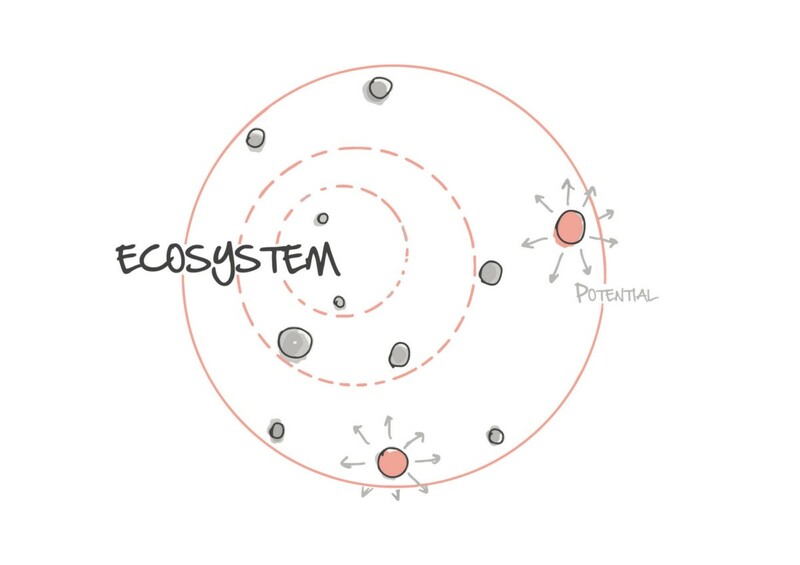 Organizations of all kind need to avoid trying to design mobilization strategies for ecosystem that are not trying to exchange value already: if we agree that the real potential grows at the edge, how can we think to define what an ecosystem needs to achieve… from the center? Platform Design is the death of inside-out strategies: never start from your capabilities, your assets, or your identity in designing a strategy, but always think how these can help you in creating a strategy that serves an existing ecosystem, exchanging value. In the ecosystem lies the center of your strategy. The ecosystem of short term rental existed for ages, before Airbnb: all was clumsy, complicated, reputation was hard to leverage. Designing for this existing ecosystem helped Airbnb thrive at a scale that wouldn’t otherwise have been possible. In the age of the long tail, consumers expect to be able to find personalized solutions to specific, custom, contextual and personal expectations. If it’s true that technology helps brands to create processes with almost zero marginal cost of production, it’s also true that traditional industrialized processes provide a near zero potential of customization. Despite brands tried tricks to solve this issue, faking personal interactions with AI (remember the chatbot frenzy? ), the only intelligence that can understand the context of interaction, and identify the best solution for a specific personal problem, remains the human one. In few words, there’s no way to industrially generate mass customization, this can only be achieved by helping entities in the ecosystem to self organize around the potential that producers have, and the expectations of consumers. Trying to respond to the expectations of the Long Tail, with an industrial, control driven, bureaucracy is a self fulfilling prophecy of failure: small customers will become unworthy if the cost you need to face to serve them, is bigger than the economic opportunity they represent, let them self-organise with producers. As one attendee to our masterclass once said, when doing platform strategies we need to “scale peerness” our ability to connect peers in interaction. 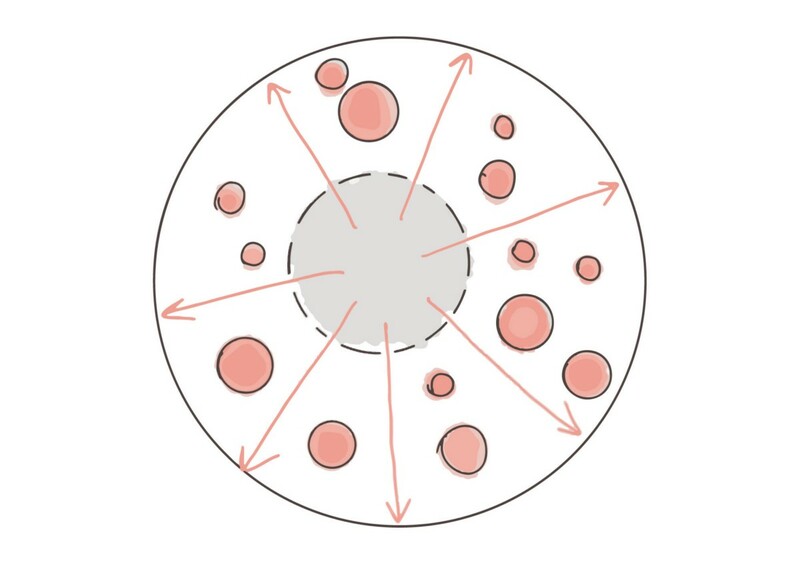 A key part of this principle resides in reducing transaction cost in self organization: as much a strategy makes it easier to self organize in niches, the smaller the niche it will empower to exist! In modern times, a broader market is made of many smaller markets. Airbnb doesn’t impose check-in and check out times, or furniture you need to use, or breakfast menu, all this is agreed in interaction, between guest and host, making a perfectly fit experience. Apple didn’t plan what set of applications were to be developed, it let developers to grow a business out of their 1000 true fans. Today’s world lives through continuous disruption, change, transformation. We even coined the term VUCA (Volatility, Uncertainty, Complexity, Ambiguity) to describe the world we live in. In this context, everyone is looking for new ways of learning, and — reciprocally — every organization is in the learning business. Modern organizations therefore need to offer participants a promise of accelerated learning; their message needs to be: “if you join us on the new terms of collaboration (platform), you’re going to learn faster than outside”. 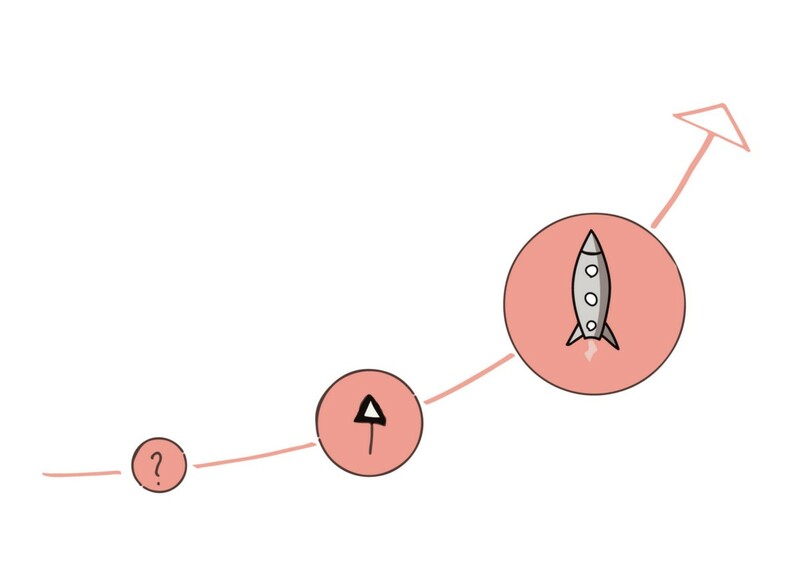 Furthermore, when offering learning opportunities, the journey must be playful, and flow-enabled: participants need to learn step-by-step, first how to interact (onboard), then how to scale and manage scaled interactions (get better), then how to test themselves in new opportunities, new contexts. Learning must be both competitive (with peers trying to outperform each other) and collaborative, through mentoring and tutoring: helping each works if there’s a promise of a broader market. To really learn, peers in the ecosystem need to also be allowed to give space to their true passions. Airbnb has offered thousands of people the opportunity to express their talent and passion for hospitality, helping them become professionals in the industry (as superhost, experience hosts, co-hosts). By offering tools, resources and conferences, Google is offering developers the possibility to scale up their operations, focus on what they like to do (develop their content), be part of an international community of like-minded, learn from each other. How do modern strategies evolve when the center of the strategy moves out of the organization, into the ecosystem? In a continuous power shift, from the brand to the consumer, and from the consumer to the ecosystem, we witness the need for the brand to give up the idea that the innovation process can be driven from a central office: is the ecosystem that innovates, that knows what are the interactions that need to be empowered, and therefore the organization needs to carefully listen. Indeed, while MIT’s E. Von Hippel pioneered this idea, with the notion of “User Toolkits for Innovation” (letting users self adapt products to their particular needs), today we can talk about “ecosystem innovation toolkits”. Platform strategies should be loose enough to leave players adapt the role they’re allowed to play, to their specific context. 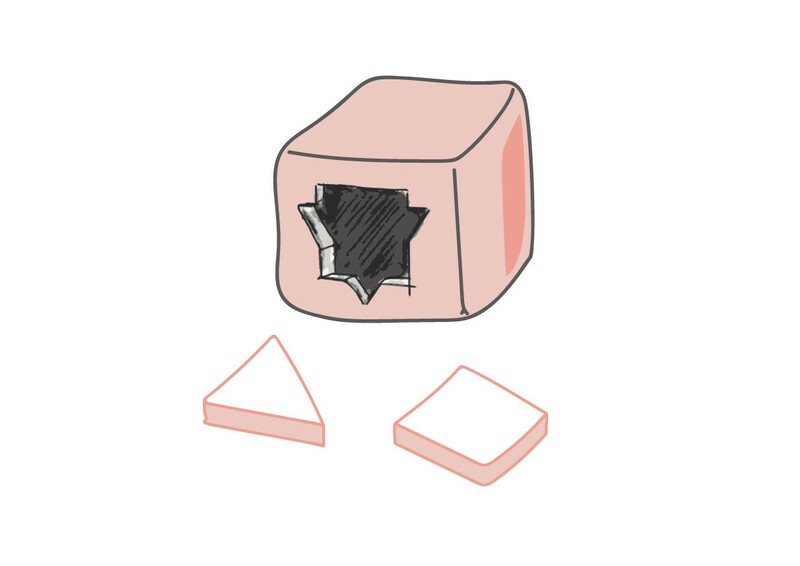 Platform designers need to “design for disobedience”, to let the players play at the edge of the rules: if a new, emergent, behavior appears as recurrent, then the platform designer needs to be there to institutionalize it, making it a feature. This is the way platform shapers embed the Innovate-Leverage-Componentize cycle: first let the ecosystem dictate new expectations, then institutionalize them and leverage them (grow them at scale), within time make them components that the ecosystem can use, to invent something new. Airbnb has been observing the players creating experiences on top of short term rentals for years: when it was clear that these experiences were a substantial part of the overall journey, they institutionalized them into one of the key feature of the platform. Let participants play loose roles: design for medical professionals (general), not for physiotherapists (specific). 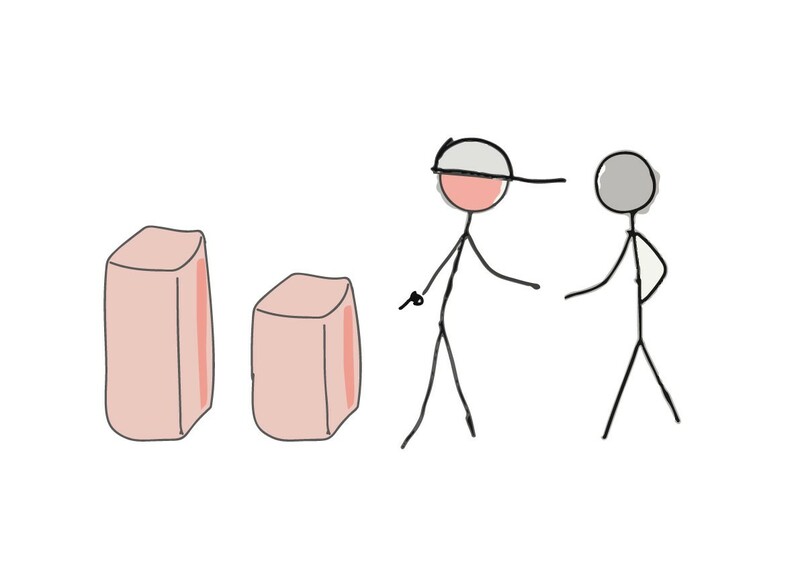 What happens when you stop producing solutions, and start designing ways to organize interactions in large scale systems? This brings the organization to move beyond the very concept of a customer (somebody you design a solution for), and embrace the concept of relationships, and interactions between peers as the key element of business. 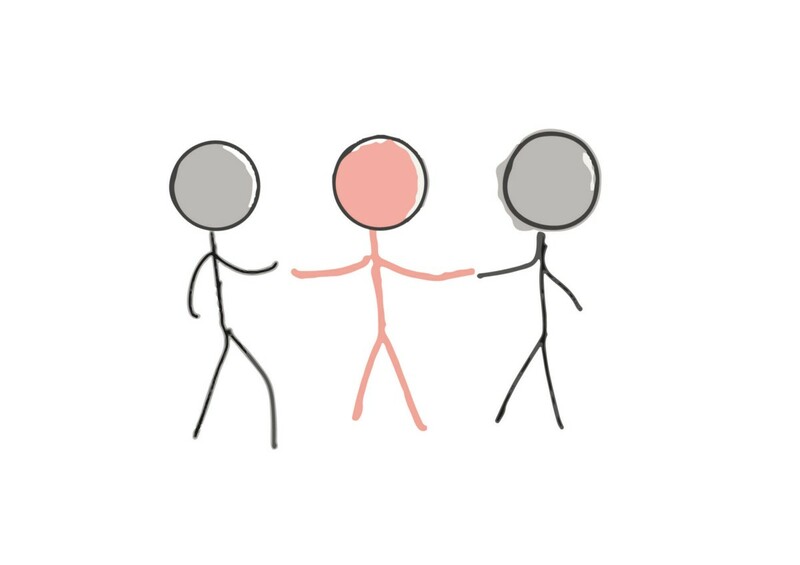 When we design to facilitate interactions between producers and consumers of value, we need to intentionally design with, and for both parties: as these parties might be in conflict (trying to maximize their outcomes), we’ll need to make sure to reduce frictions in the relationship, and make them ready to embrace the interaction. This essentially boils down to: reducing the potential conflicts of interest (by helping them to find a common, and fair ground), and to make non-zero sum games possible. If the value we generate in the exchange is greater than the original sum of needs and potential, this normally makes the interaction extremely more valuable. In a marketplace, when two parties interact and generate positive reputation, the sum of the value generated in the interaction goes beyond the value exchanged in the interaction itself: reputation is a long term attractor of other opportunities. Ebay, uses an online mediation service to ensure that disputes between buyers and sellers are set, in a way that is perceived fair to the parties. This increases the willingness to trade. When trying to capture the opportunities of a connected economy, and world, brands and organization need to understand that they need to let go their identity. This means losing control, therefore potentially renounce to use a particular brand because the brand may be perceived as conflictual with the ecosystem (for example, by competitors that a platform shaper might want to transform into providers). Renouncing to the brand may also be seen as a way to reduce the impact of some negative cases that — inevitably — will happen in less controlled or vetted ecosystem, where, to a certain amount, the organization needs to open doors to riskiest, and therefore more accessible, players. If the premise is to grow a bigger market, this market will eventually need to go farther, be less controlled (from the organizer). The organizer of the ecosystem will need to identify more with the whole (the objectives of the whole), and think strategies (and business models) that actualize the opportunity for the whole, instead of the organizer alone. When Google launched Android OS, they deliberately kept the OS as independent by Google, created a shared governance alliance (the OHA) and this ended up powering a thriving ecosystem that completely transformed the whole smartphones industry, allowing smaller players to play a role. From the work we’ve been doing with pioneers and gamechangers of all kinds — from the private sector to the public, from small nimble startups to the most important incumbents of our society — these principles are inherently there, they exist as an expression of the connected society we live in: choose to ignore them at your own peril. Complying with these principles is the best way to future-proof your ideas at today, and to enhance your opportunity to shape larger ecosystems of value creation, making your vision, business, organization one worth joining, for the long term. For those that want to play with these principles, please find the PDF download here, click on the image below to download. Do you want to learn how to use this methodology from the ones that created and evolve it? 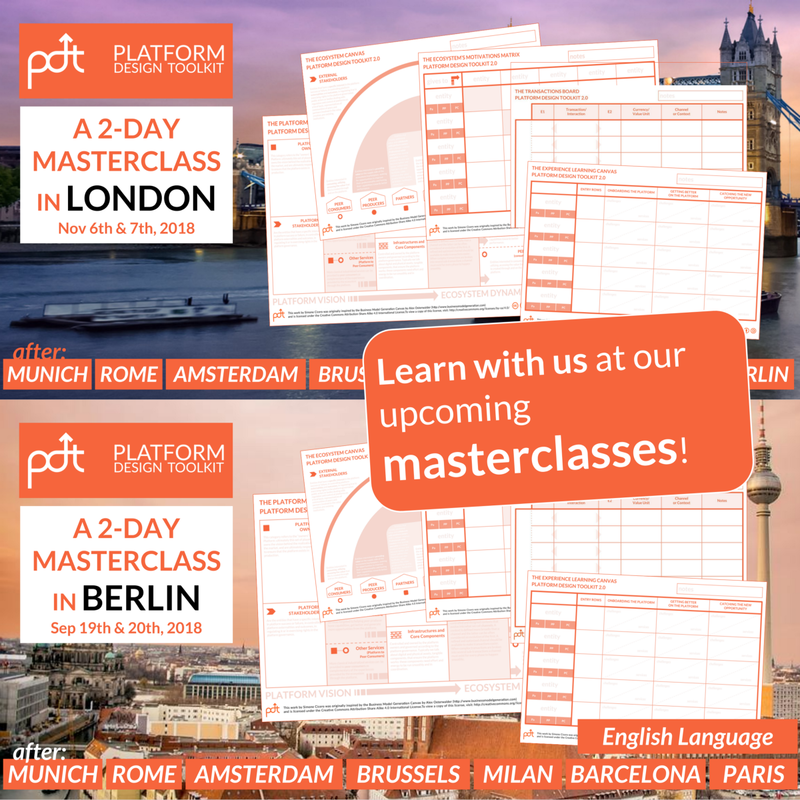 Join our upcoming Masterclasses. Check all available masterclasses here on our website. Reach out directly for special deals and large groups. As you may know, everything we do is released in Creative Commons for you to use. In case you’re getting value out of these reads and tools, we encourage you to click the 👏button and hold down to 20–50 claps as this will help us to get more exposure, and hopefully work more on developing these tools. Thanks for your support! 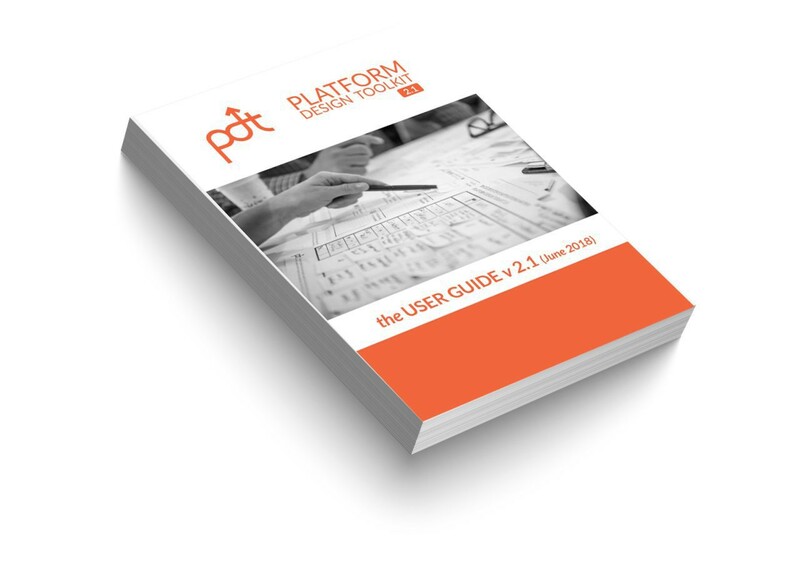 Download Platform Design Toolkit 2.1 and start playing the platform game! Download The new Toolkit and User Guide. Click here.